Arsenal's Premier League title hopes took another huge blow as they were held at home by Liverpool. The Gunners made a lethargic start and fell behind to Peter Crouch's powerful finish into the bottom corner. Nicklas Bendtner levelled when he met a Cesc Fabregas free-kick and powered his header past Pepe Reina. Arsenal boss Arsene Wenger urged his side forward looking for a winner but Andrei Voronin wasted two good chances to give Liverpool victory late on. With Manchester United still five points clear, and with a game in hand, Arsenal's title ambitions look all but over. Wenger desperately needed a win here if his side were to retain any realistic hopes of overhauling United at the top but Liverpool were never likely to roll over. As expected, both sides made several changes from the teams that drew 1-1 here on Wednesday in the first leg of their Champions League quarter-final. Only three of the Liverpool side that started that match began here - goalkeeper Reina, Jamie Carragher and Martin Skrtel - as Reds boss Rafa Benitez confirmed his focus was on the second leg of that tie at Anfield on Tuesday. Arsenal's side seemed stronger on paper but they were poor in the early stages and it was the visitors who had the better chances. Crouch, playing up front on his own, tested Gunners goalkeeper Manuel Almunia from 30 yards with a dipping shot. Crouch was involved again when Liverpool next came forward, slipping the ball on to John Arne Riise, who lost his marker Justin Hoyte but blasted his shot over the bar when clean through. That failed to rouse Arsenal from their slumbers, however, and they were fortunate to escape again when Yossi Benayoun dragged his shot wide from inside the box. 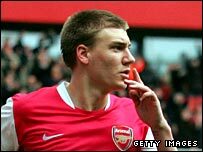 The Gunners only began to come forward as half-time approached and Bendtner should have done better when the ball fell for him after Carragher tackled Theo Walcott, the Dane shooting weakly at Reina. Emmanuel Eboue was also wasteful when he ran clear and his poor first touch was followed by a cross that was cleared by Steve Finnan. But just as Arsenal were enjoying their best spell of the match, they found themselves behind. Crouch met Reina's goal-kick, picked up the ball from Benayoun and drove forward to the edge of the area before drilling a low shot into the bottom corner. That left the Gunners 45 minutes to turn things round and they made a decent start. Kolo Toure headed wide from a Fabregas corner, before the Spaniard conjured up the equaliser from another set-piece. Fabregas curled in a free-kick and, with Reina stationary on his line, Bendtner rose to power home from close range. But the expected Arsenal onslaught in the final half hour did not materialise and it was Liverpool who had the best chances to take all three points. Crouch set up Voronin but he screwed his shot well wide and the Ukraine striker made an even bigger hash of his next chance, rounding Almunia but falling over as he tried to shoot from a tight angle. Arsenal had plenty of possession but few clear openings and their best opportunity was wasted when Alex Hleb failed to control the ball when well placed in front of goal. BBC Sport Player Rater man of the match: Peter Crouch 8.26 (on 90 minutes). 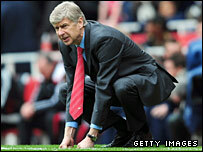 Arsenal: Almunia, Justin Hoyte (Adebayor 57), Gallas, Toure, Traore (Clichy 72), Eboue, Fabregas, Silva, Flamini (Hleb 81), Bendtner, Walcott. Subs Not Used: Lehmann, Song Billong. Liverpool: Reina, Finnan, Carragher, Skrtel, Arbeloa, Plessis, Pennant (Gerrard 66), Benayoun (Voronin 75), Lucas, Riise, Crouch (Torres 80). Subs Not Used: Itandje, Hyypia.